Mother's day is one of the sweetest event of the year, when we can wish any mother a very happy mother's day. Now you can spice it up further by sending the word "Mother" in many languages. You can directly forward this page by clicking here, or copy the text, by clicking here, and send then with Mother's day greeting cards. Enjoy the Happy Mother's Day wishes in many languages. 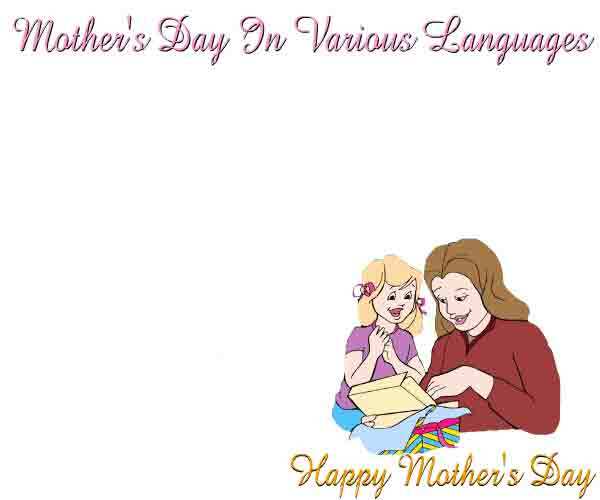 If you are looking for the "Mother's Day" in various languages, then click here.